After a 32-year battle with Parkinson's disease, Muhammad Ali passed away at the age of 74 on Friday, June 3rd, 2016 in Scottsdale, Arizona. Ali fought hard for and won the heavyweight title a record-setting three times in his impressive twenty-two year career, but it will be his positive activism out of the ring that made him one of the most beloved athletes in American history. His charisma, athleticism, talent, and eloquence propelled him into stardom, but his advocacy for civil rights earned him the respect of the world. In light of Ali’s significant contribution to sports and civil rights, the team at Soboba Casino has decided to honor his legacy by giving their guests the opportunity to send their condolences to the Ali family. Fans and members of the community are invited to come to Soboba from Tuesday, June 7th. 2016 to Wednesday, June 8th, 2016 to write a message of sympathy in a book of condolences located at the front entrance of the casino. 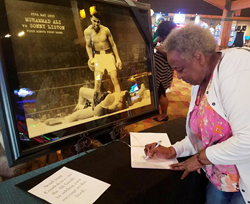 At the conclusion of Wednesday’s signing the book will be overnighted to the Ali family in Louisville, Kentucky before the Champ’s funeral on Friday.